Project obstacles and solutions: The J.W. Marriott is the newest and largest hotel in downtown Indianapolis. The Art Plaza separates the hotel's lower level restaurants from White River State Park. CSO Architects designed the space to be an outdoor dining area and visually appealing from both street level and from the upper level hotel room windows. Smock Fansler was hired to do all of the decorative concrete concrete work. This included combining broomed concrete leaf motif shapes surrounded by exposed aggregate concrete. Each leaf was precisely cut to be uniform with the other leaves. 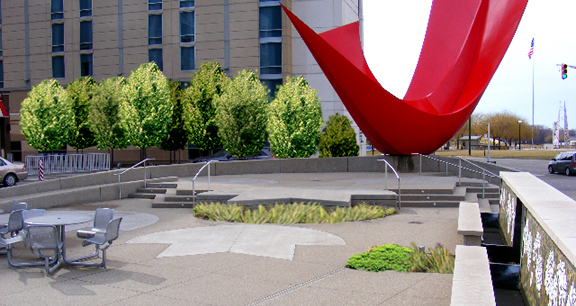 The area includes art sculpture, permanent and removable seating, and plant gardens. IMI provided 80 yards of exposed sand matrix concrete for this project. This job won a 2012 Short Course Award for Commercial/Industrial Concrete - Concrete Art from the Indiana Ready Mix Concrete Association.